When it comes time for us to make your fantasy a reality, it will happen in a private heated pool with an assistant there to help you feel as safe and secure as possible. This is where we have the opportunity to be free and get creative and create amazing images for you and your loved ones to admire as well as pass down to future generations. Your images are truly priceless! We will start out slow and build up to more challenging levels as you feel comfortable. I will never make you do anything your not comfortable doing, this is your experience and I will do everything I can to respect and honor that. The session will be approximately 2 hours in length. Any additional time required or desired will be on a basis of need at my hourly rate of $300/hr, or fraction thereof. Most importantly I will urge you to have fun! I want our sessions to be as fun and stress free as possible, maximizing our experience together in this unique portrait opportunity. Included are two pre-consultations. One of these is above water and will allow us to get to know one another as creative individuals. After we've gotten to know a little more about each other we will discuss your previous experiences and comfort level in an aqueous environment. We will also discuss what we can do to make the process as comfortable as possible for you and tailor your session just for you, including but not limited to what you want out of the session in terms of products and an over-all experience. Hair, make-up and wardrobe will also be discussed and thought out during this time, but it is not included in this package. I would be more than happy to help you find the perfect services to fit this need. This is our time together to create and plan your ultimate fantasy! The second is our first chance to get in the pool together! This session is purely to introduce you to the underwater environment and prep you for the final shoot. Most people feel so energized and rejuvenated after this process because they have accomplished the most challenging part of this amazing experience! 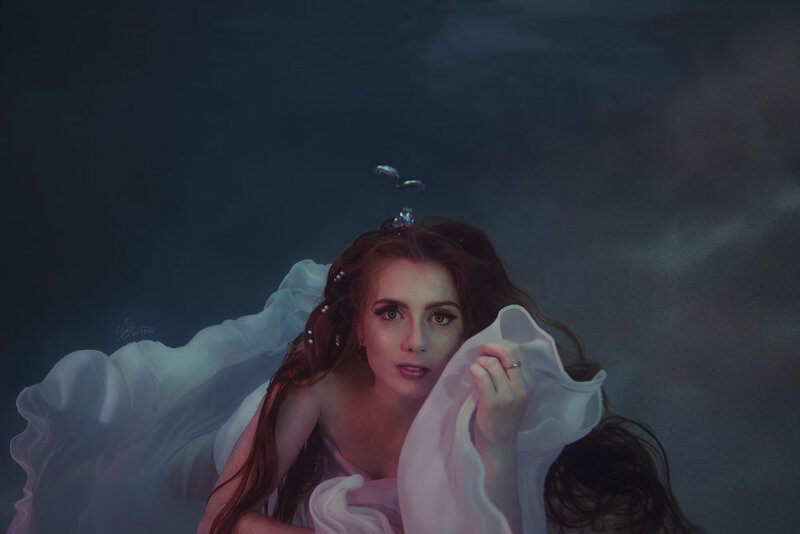 You will know how to feel comfortable and relaxed while underwater and we will practice some body movements and facial relaxation techniques that will help us get that enchanting moment in time we're working to create. Once our images have been captured I will review them and create a slideshow for you to view the images and we will make a selection of the final image(s) of your choice. The selected image(s) will then go through a highly detailed and professional color correction and retouching process done by me to make sure your images are of the best quality they can be. Included in this package is a 16x20 archival print of the image of your choosing. You will also receive a high quality watermarked image for sharing on the web with family and friends. To assure that consistency and printing are at the highest possible level of quality in your photographic products I recommend purchasing any additional prints, frames or products directly through me during this consult and prices will be discussed upon request. Packages can be created and will be tailored to your specific needs. Splash Portraits are designed for children and teens and are a stripped down version of my commissioned package. We will have a phone conversation about your expectations and desires for the session, discuss clothing options to be provided for by you and then we will have a 1.5 hour pool session. We will also have a 1hr image review session for the opportunity to view and purchase prints. This includes everything listed in the commissioned portrait package, with the addition of hair & make-up services, wardrobe and the incorporation of my custom designed digital art to compliment and bring your fantasy image to complete fruition. There are virtually no limits here except our imaginations! Upgrades are always available to make sure your exact needs are met and can be discussed in either the pre-consultation or image review session. Shoot times can be increased for additional cost which includes my hourly rate of $300 plus any extra cost for pool rental and heating. Packages can be created and tailored to your specific needs and desires and cost will be discussed during our image review session.